Kris Patterson added to his points lead over Brian Ruhlman at Oakshade Raceway by edging out Todd Schroyer on the final lap of a very exciting late model feature race Saturday night. Schroyer started from the pole and shot out to lead most of the race. The only caution flag waved on lap 2 after Rick Delong and Casey Noonan made contact resulting in Noonan to spin. Schroyer continued to lead over Ruhlman and Rusty Schlenk. Patterson, who started 14th, worked his way up to fourth by the halfway point in the race. The leaders worked through heavy traffic with Patterson continuing to close in on Schroyer for the lead using the low groove. The two raced side by side for the lead in the closing laps, but then Patterson got hung up behind the lapped car of George Lindsey who was running the same line as Patterson. This allowed Schroyer to pull away by a couple car lengths, but Patterson eventually got by Lindsey and quickly closed back in on the leader in the final lap. 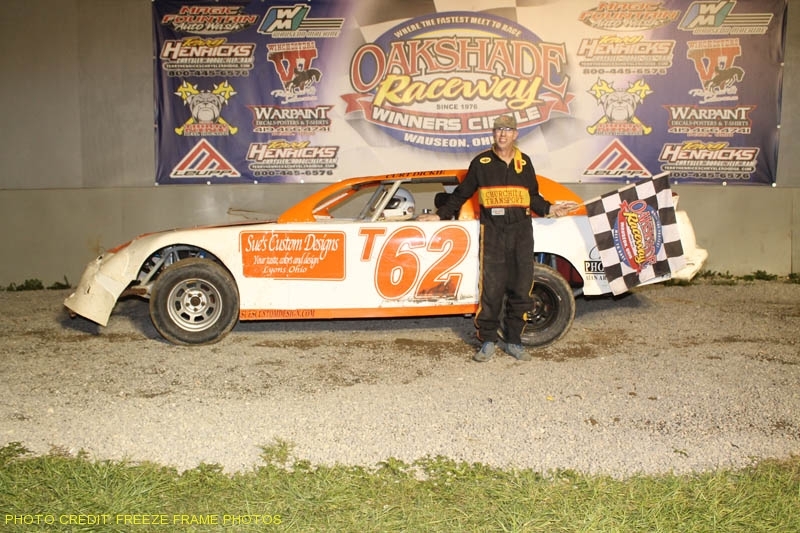 Patterson got along side Schroyer in turn four and won the drag race to the finish line by just the nose of his car to pick up his second Oakshade feature win of the year. Schroyer settled for second ahead of Aaron Scott, Brian Ruhlman and Rusty Schlenk. More exciting racing continued in the sportsman feature with Mike Jessen and Tim Fisher putting on a great battle running door to door for most of the first part of the race. Jessen held off the initial charge from Fisher, but Fisher regrouped and came back to take the lead on lap nine and began to pull away. Fisher caught a bad break on the 16th lap when he got caught up in an incident with Chris Keller that brought out the yellow and forced Fisher to restart at the tail. That turned the lead over to Ray Klawitter with four laps to go. Brad Kendall got to the inside of Klawitter with two laps remaining, but Klawitter held him off to pick up his third sportsman feature win of the year. Kendall finished second with Jessen third. Jeremy Grover and Rob Liaeff rounded out the top five finishers. Multiple incidents marred the first lap of the bomber A Main feature as Dennis Laney lost his car over the top of turns one and two, Dan Dippman and Bill Toedter crashed on the backstretch and Craig Dippman spun in turn four. After a complete restart, Jake Rendel found himself out in front of the bomber points leader, Jim Scout, and Dan Bliekamp. Those top three started to pull away from the rest of the field. Scout suffered mechanical problems on lap eight while still running second and fell off the pace and retired to the pits. That moved Bliekamp up to second with Leininger third. The running order remain unchanged as the field took the checkered flag with Rendel winning his second consecutive A Main and his third of the year. Josh Steinacker finished fourth behind Bliekamp and Leininger with Jeff Foks coming home fifth. Kevin Hanford led from the start of the bomber B Main, but failed to come back up to speed on a restart after a caution on lap six. Curt Lancaster went from third to the lead, as Mark Henderson had to check up to keep from running over Hanford on the restart. Lancaster went on to post his second B Main win of the year over Henderson, Randy Murday, Jacob Gamber and Richard Patton. Karl Spores was leading the bomber C Main when a series of events took place on lap three and ended up with the race stopped under a red flag. First, Kolbey Wirth got into the front stretch wall. Then Jeremiah Floyd had problems on the backstretch and Bill Amstett and Ron Leonard got together in turn two with Amstett’s car ending up upside down on its roof. Amstett climbed out of his car under his own power. Once racing resumed, Andy Borton worked his way through the field and went around the high side of Spores to take the lead on lap six. He went on to win his second C Main of the year. Spores finished second ahead of Tommy Huff, Steve Dempewolf and Steve Reeves. More great racing action continues Saturday, July 31 with all three divisions back in racing action.